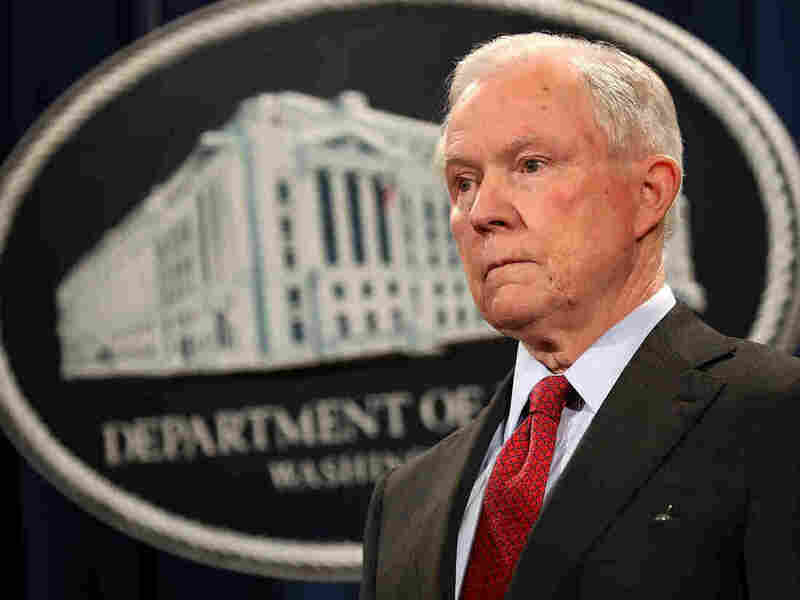 Jeff Sessions Interviewed By Special Counsel Robert Mueller In Russia Inquiry The attorney general might be the first member of the Cabinet to talk with investigators in the special counsel's office as they investigate potential criminal conduct. Attorney General Jeff Sessions gave an interview to Justice Department special counsel Robert Mueller's investigators last week, a spokesman confirmed. Attorney General Jeff Sessions was interviewed last week by special counsel Robert Mueller as part of the investigation into Russian interference in the 2016 election. Sessions is the first member of President Trump's Cabinet known to have been questioned by the special counsel's office in its investigation into possible coordination between the Trump campaign and Moscow. Justice Department spokesman Ian Prior confirmed Sessions' interview to NPR on Tuesday. Sessions cooperated voluntarily. Trump told reporters in the Oval Office on Tuesday that he was "not at all concerned" about Sessions' interview and that he didn't talk to the attorney general about the session. The special counsel's office declined to comment. In the attorney general's meeting, which was first reported by The New York Times, Sessions answered questions about the Trump campaign's contacts with Russians and their proxies during the 2016 presidential campaign. The Times also reported that Mueller's office spoke with former FBI Director James Comey last year. Sessions is understood to have discussed possible obstruction of justice in the firing of Comey — a dismissal that Sessions supported. As a U.S. senator from Alabama, Sessions became an early endorser of Trump when the real estate tycoon was struggling for support from lawmakers and his chances of winning the White House seemed remote. Sessions served as a top aide to the campaign, and he helped lead the foreign policy team. He was rewarded for his loyalty with the position of attorney general after Trump's surprise election win. But Sessions recused himself from the Russia investigation in March because of his role in the campaign. He said he made the decision after consulting with career Justice Department officials. The timing of the decision was notable for another reason: It followed reports of contacts Sessions had with Russian Ambassador Sergey Kislyak during the campaign. During his confirmation hearing, Sessions told senators that he had had no contacts with Russians during his time as a campaign aide. Later, in a series of appearances before congressional committees over the past year, Sessions has defended his record and denied any inconsistency in his statements, even as more contacts between campaign officials and Russians have come to light. One member of the Trump campaign foreign policy team, George Papadopoulos, has pleaded guilty to lying to the FBI about his contacts with Russians. Russian agents importuned him soon after the announcement that he had joined the Trump team, offering dirt on Democratic candidate Hillary Clinton and "off the record" meetings between him or other campaign officials and top Russians. Papadopoulos, who briefed his superiors about those offers, is cooperating with investigators. First Guilty Plea In Russia Probe: Who Is George Papadopoulos? Sessions' recusal has also earned him a steady stream of criticism from the president, who has repeatedly chastised the attorney general in public and behind closed doors. In July, for example, Trump lashed out at Sessions on Twitter, saying he "has taken a VERY weak position on Hillary Clinton crimes (where are E-mails & DNC server) & Intel leakers!" Late last month, the president told The New York Times in an interview that it was "too bad" that Sessions had recused himself. The Times also has reported on the pressure that Trump had exerted on Sessions not to recuse himself and to keep control of the FBI's Russia investigation. Several current and former White House officials are believed to have been interviewed by Mueller, who took over the investigation into Russian interference in the 2016 election eight months ago. He was appointed special counsel by Deputy Attorney General Rod Rosenstein a week after Trump fired Comey. Comey's dismissal — and whether it was part of an effort by the president to obstruct the FBI's Russia inquiry — has become an aspect of Mueller's investigation. Comey has testified under oath that the president asked him to back off the investigation into former national security adviser Michael Flynn, who has pleaded guilty to lying to the FBI and is cooperating with the special counsel. The White House originally pointed to a three-page memo from Rosenstein and a one-page letter from Sessions to support its decision to dump Comey. Days later, Trump told NBC that he was "thinking of the Russia thing" when he fired Comey. The report this month in the Times raised questions about a possible Sessions role in a potential obstruction of justice case. The newspaper said that a Sessions aide asked a congressional staff member for dirt on Comey and that the attorney general wanted one negative story on the FBI director in the press each day. The Justice Department denied that report.